Contact lenses can be great for sport. They offer a wider field of vision, stay in place even when you are active, and cut the risk of injuries from a regular spectacle frame. You can also wear contact lenses in combination with sunglasses or sports goggles. Gas permeable contact lenses are not good for contact sports. If contact lenses don’t suit you, there are prescription inserts available for specialist sports eyewear too. Ask your dispensing optician for advice about specialist frames for sports and how they compare to contact lenses. Contact lenses can make swimming a better experience, but you need to take care as there are all kinds of nasty bugs living in swimming pools that can take up residence in your lenses and cause eye infections. Swimming goggles can help keep water out of your eyes. Most authorities agree you should not swim in contact lenses. The British Contact Lens Association advises: “Never wear contact lenses for swimming – or in hot tubs or whilst showering or participating in water sports – unless wearing tight-fitting goggles over the top. After swimming – or if lenses are removed and stored whilst swimming – contact lenses should be cleaned and disinfected in fresh solution before putting them back on the eyes.” Disposable lenses, which you throw away after swimming, can cut the risk. Speak to your eyecare practitioner before swimming in contact lenses. Generally speaking, if you are advised that you need eye drops you will also be told not to wear your contact lenses at the same time. The preservatives in some types of eye drops can irritate the eyes if they get into your lenses, while if you have an eye infection that you need drops for, you need to avoid wearing lenses until it is completely resolved. Ask for advice about how to avoid reinfecting yourself when you reinsert your lenses. Some drops are preservative free and compatible with contact lenses: ask your practitioner for advice before using any eye drops. If you need eye drops to keep your contact lenses feeling comfortable, then you may need a different type of lens. No. Tap water can contain bacteria that can cause sight threatening infections. Always use the solutions recommended by your practitioner. Some contact lenses can be worn at night, but not all types of lenses. 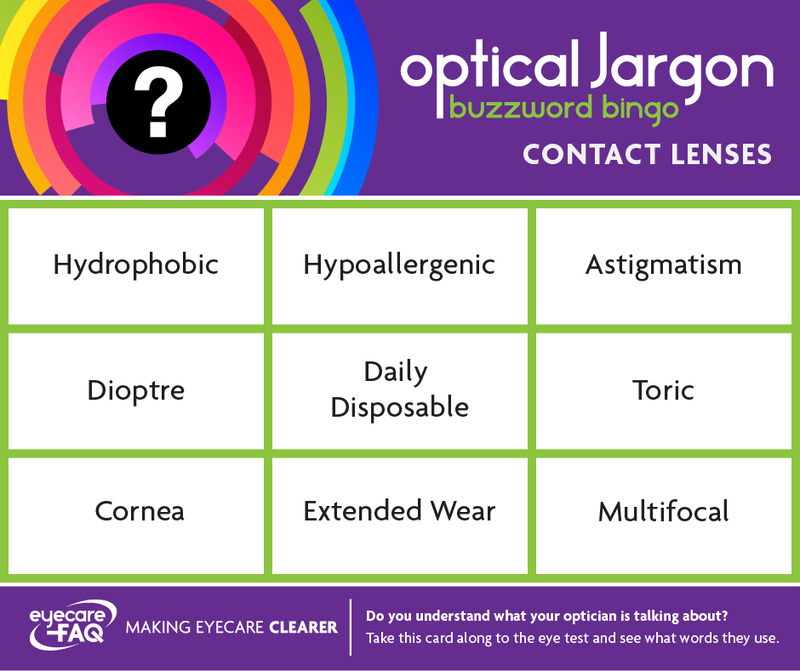 If this is important to you, talk to your practitioner first as they may suggest a different type of lens to the one you are wearing. Never sleep in your lenses without advice from a professional as the wrong type of lenses worn overnight can deprive your eyes of oxygen and increase the risk of eye infections. Yes. It’s often easier to put in your contact lenses before putting on make-up. Be careful not to get make up in your eyes as this can make the lenses, and your vision, smeary. Make sure you replace your eye make up every few months as bacteria can grow in make-up and cause eye infections. Never share eye make-up. If you have sensitive eyes look out for hypoallergenic make up and avoid mascara with fibres that may irritate your eyes. Never wear eyeliner between the lashes or on your lower eyelid as this can attached the contact lenses. Tap water can contain bacteria that causes sight threatening eye infections. The safest way to do it is to shower first, then insert your lenses. The air in a plane is air conditioned and may make your eyes feel dry. You can wear lenses, but make sure you have your specs with you and remove your lenses if they feel uncomfortable. A longer flight is more likely to cause problems. Lubricating eye drops, specially designed for contact lens wearers can also help. Daily Disposable soft lenses are worn once then thrown away. Two weekly and monthly soft lenses must be removed and cleaned daily. They are designed to be replaced after a certain interval. Extended Wear or ‘continuous wear’ lenses can be worn for up to 30 days, and allow you the flexibility of being able to sleep in your lenses. There are also some that can be work for one week continuous wear. Toric contact lenses have a different focusing power horizontally to vertically, and as a result can correct for astigmatism. Multifocal lenses will help you if you have a different prescription for distance and reading. This type of lens allows you to see at both distances with just the one lens. Rigid gas permeable lenses provide better vision for people with certain eye conditions. They are smaller than soft lenses and hence cover less of the cornea. Scleral lenses cover the cornea and part of the white of the eye, the sclera. They are generally made of a rigid material and can improve your vision where other lenses do not if you have an irregular cornea or condition such as keratoconus. Cosmetic contact lenses can change the colour of your eyes or create a special effect. These should only be purchased from qualified and experienced eye care professional. A contact lens optician (CLO) is a specialist practitioner who is trained and qualified to fit, and provide aftercare for, patients with contact lenses. Contact lens opticians assess whether contact lenses meet the needs of their patient, resolving clinical and tolerance issues, and remain responsible for clinical decisions enabling them to provide continuity of care to their patients. The contact lens specialty is undertaken by dispensing opticians and involves extra study and clinical practice. Once the specialist training is completed and competence assessed, practitioners must register their specialty with the General Optical Council. They are then able to perform additional duties to those of a dispensing optician. Optometrists perform eye examinations and also fit contact lenses. Ophthalmologists are medical doctors who specialise in the treatment of eye diseases but some also fit contact lenses, sometimes as part of a treatment.